Prepare your taste buds for the perfect, refreshing combination of Peach and Mango. IdealBoost provides the ultimate pick-me-up and hunger-blocking support, so you can stay energized and curb your appetite during the day to reach your weight loss goals. Crush Your Cravings and Ignite Your Metabolism! 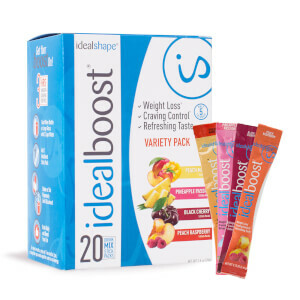 IdealBoost includes our unique hunger-blocking formula to increase fat loss (green tea + caffeine), help you control your appetite (Slendesta + Fibersol), and improve your health and mood (Vitamins B3 + B6 + B12). Want to kick your soda addiction and improve your mood at the same time? 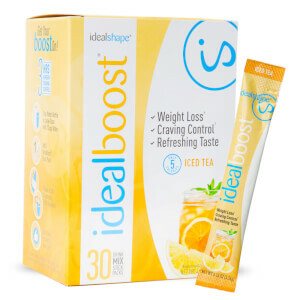 Enjoy a glass of refreshing IdealBoost, and reach your weight loss goals faster! This new IdealBoost flavor is both delicious and refreshing. Now you can enjoy a taste of paradise in a glass (or water bottle) by simply mixing one packet of IdealBoost Peach Mango with chilled water anytime you need to block hunger and boost your energy! 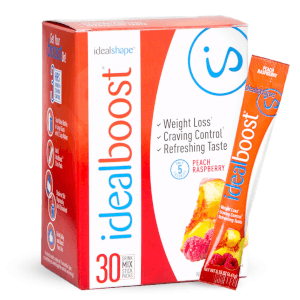 IdealBoost curbs appetite for up to 3 hours with our all-natural hunger-blocking blend. 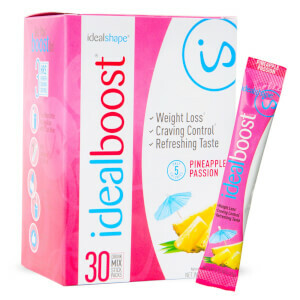 Drink some IdealBoost after breakfast and stay full until lunch. This powerful ingredient is also used in our shakes and bars to help kick cravings and banish snacking between meals. Reduced body weight, smaller waist size, and lower body fat are three goals that people focus on when losing weight. Regular consumption of green tea and caffeine can help with all three! Green tea naturally contains a small amount of caffeine, but adding extra caffeine amplifies the beneficial effects, improving leptin levels and helping the body BURN FAT more efficiently. IdealBoost revs your metabolism so that you can start letting go of unwanted fat. Malic Acid, Natural & Artificial Flavors, Maltodextrin, Acesulfame Potassium, Sucralose. Does as it is advertised to do and tastes good. I do have to dilute it more because it is a bit sweet for me, but it helps me control hunger and get my daily water consumption in! Probably my favorite flavor of Idealboost!!! I have been buying this product for 3 years and love it. Easy to take on trips or in your purse. It really helps curb my cravings. I waited for quite sometime for this flavor to be brought back, and when it was, I bought 4 boxes. IdealBoost is my favorite way of satisfying sweet cravings and curbing my appetite for about an hour. I drink IdealBoost almost every day. I thought pineapple passion was my favorite flavor(although still good) until I tried this one! So delicious and just the right pick-me-up. I received this in a variety pack. This was by far my favorite flavor. It really did give me a slight boost of energy and made me feel like I just ate something. I suggest mixing it in the shaker and leaving the filter in because the foam is a bit much in a water bottle. The peach mango is my favorite...its such a nice blend (funny because alone I'm not crazy about peach OR mango) lol! It take care of my sweet craving and does give me a boost of energy. Just be careful when ordering, there is a peach raspberry (unfortunately I did b2g1free and got wrong one🙄) so 3 boxes of wrong one.... hope this helps! I love peach and this is by far my favorite Ideal boost flavor! Tastes just like real peach mango while giving you energy and keeping you full! Definitely helps to reduce snacking, would highly recommend! Love the flavor, very good!